One of the more significant behind-the-scenes changes that took place following Apple's media event yesterday was an overhaul of the collections the Apple Watch is offered in. With the introduction of new colors to pre-existing bands like the Modern Buckle, Classic Buckle, and Sport Band, along with an entirely new offering in the Woven Nylon band, the configurations offered to customers who don't yet own an Apple Watch can be a bit daunting to decipher. To make room for the new bands in its Apple Watch collections without significantly expanding the number of models, Apple has phased out several previous models from its collections. For example, Apple no longer offers bundles with the (PRODUCT)RED Sport Band, White Sport Band, Black Classic Buckle, Midnight Blue Modern Buckle, Soft Pink Modern Buckle, Midnight Blue Leather Loop, or Stone Leather Loop. Each of the bands remains available to purchase separately, but anyone with an eye for these particular styles looking to buy an Apple Watch for the first time will have to put down money for another collection first or try to pick up one of the discontinued combinations on closeout. Since there are so many new configurations replacing older bands, all at varying prices and availability, MacRumors has put together this breakdown of all of the new collections in one place. Starting with the ten new collections of the stainless steel Apple Watch, these are the new options available for you to purchase from the Apple online store. With the sole exception of the Space Black collection (which has the only Sport Band now offered as a starting point for stainless steel Apple Watches), the entry point for the mid-tier Apple Watch line has expanded with the Woven Nylon bands. Despite the fact that there are seven total colorways able to be purchased separately, Apple is only offering the Pearl color in a collection. The price jumps $100 when choosing new colors in the Classic Buckle line. There's more of a limit to customization here, unfortunately, with the new Red Classic Buckle only available in a 38mm collection, and the Marine Blue Classic Buckle only offered in a 42mm collection. As usual, every Classic Buckle color is for sale in either 38mm or 42mm sizes individually. Apple introduced seven total new Classic Buckle colors on Monday. The new Leather Loop and Modern Buckle collections are simple color switch-outs as well, with sizes locked into the exclusive measurements of each respective band (Modern Buckle is only sold in 38mm and Leather Loop is only sold in 42mm). The new Stainless Steel collections are rounded out by the long-rumored Space Black Milanese Loop, offered in both sizes with the matching Space Black Stainless Steel case. In comparison to Stainless Steel, the Aluminum Apple Watch Sport only saw two collections phased out in the transition that occurred yesterday, with buyers now unable to purchase bundles with the Orange or Blue Sport Band. Apple did, however, add four new combinations to its Sport lineup, bringing the total count of new bundles to fourteen for those looking at the more rugged and athletic wearable device. Of the six new colors offered in the Sport band line -- Yellow, Apricot, Royal Blue, Light Pink, Lilac, and Mint -- the company has decided to present Yellow, Apricot, and Royal Blue in bundles. Each is available at the company's new lowered price of $299 for 38mm or $349 for 42mm. The other eight new additions to the Apple Watch Sport collection encompass some of the new colors of the Woven Nylon bands. 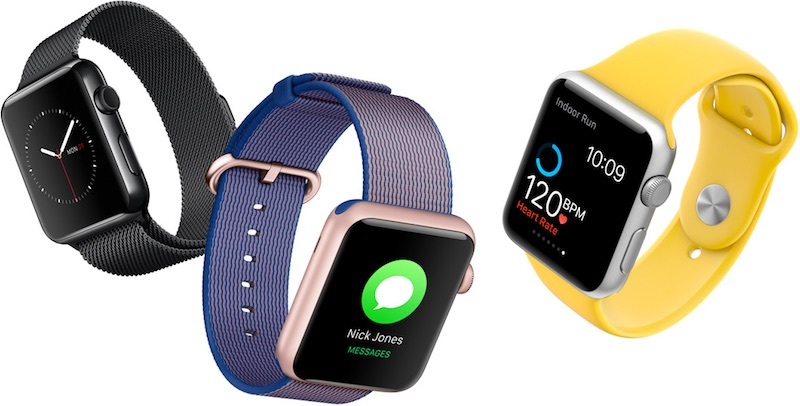 Apple has restricted the Pink and Gold/Red Woven Nylon bands to 38mm bundles, and the Scuba Blue and Gold/Royal Blue Woven Nylon bands to 42mm bundles, but the remaining four options give buyers a choice in size. It should be noted that the bundles with Royal Blue and Gold/Red Woven Nylon bands have color-matching Rose Gold and Gold hardware respectively. When purchased as standalone bands in these colors, the hardware is standard Silver aluminum. The shipping status of each new bundle in the Stainless Steel collection varies, but the most in-demand bundles appear to be the 38mm Red Classic Buckle (1-2 weeks) and medium size 42mm White Leather Loop (5-7 business days). Otherwise, at the time of writing, every Stainless Steel bundle should ship in about 1 business day. The shipping times for the new Apple Watch Sport bundles are similarly quick, with every model ready to ship within 1 business day except for the Rose Gold Aluminum Case with Royal Blue Woven Nylon. Out of all of the new models -- Stainless Steel and Aluminum alike -- this is the only new bundle that isn't available to purchase immediately and simply states that it will be "coming soon." Other than the new Apple Watch collections, Apple introduced the iPhone SE and 9.7-inch iPad Pro during its "Let Us Loop You In" event on Monday. Catch up with the news in the MacRumors Event Recap and read about the various tidbits from the keynote that might have slipped through the cracks. And this is proof you clearly have no clue. Did apple really need to waste time at an event just to introduce new bands? They have have been known to drop a new laptop on their website without announcing it so why all the fuss about new watch bands? The Apple Watch should be bought through a build-your-own style process. Pick a collection, pick a size, pick a band. Show reccommended bands for that model. I would be in for an Apple Watch at $149-$199. I think I would derive about as much usefulness and enjoyment out of it as my AppleTV. Get a strap that's cheaper than the actual watch, unless you're mad. Ooooh, that imaginary thing makes me so angry! By "Apple don't recommend", do you have a source where Apple actually says, "we don't recommend putting the Milanese loop band on the sport watches"? Or are you inferring a lack of recommendation because Apple has not gone out of their way to say, "those two go great together", or...? They don't sell such a pairing, but I've never seen them say, "doing this would be bad". I'm more annoyed that they offer so few properly matched band choices for owners of the Space Black and Space Gray watches. The sport bands and leather loops have their main colored material color at the point where the watch attaches, but the classic leather bands, for instance, all have shiny silver/chrome hardware where they attach to the watch. Bad look to have silver sittings jutting out of a black watch, to connect a black or brown band. When the watches were first released, it wasn't clear that they were going to treat their black watches as second class citizens. I suspect that numerous other day one purchasers share my frustration with this. I might have gone with a silver colored Apple Watch if I'd known it was going to get such preferred treatment compared to the black watches. I'm surprised there is no build to order option on the Apple Store where you can mix and match the bands, buckles and attachments to compliment your watch. Apple are famous for their attention to detail and it must drive Jonny Ive mad knowing that there are thousands of his meticulously designed products out there adorned with mismatched accessories. The odd thing to me is that the bands which match the Gold aluminium Sport watch appear to only come with gold buckles if purchased with the gold watch. For instance, if I try to buy the Royal Blue woven nylon band on their site, all images show a silver buckle rather than gold. Yet in the images with the gold watch, the band has a gold buckle. So can the gold-buckled bands which match the gold watch only be purchased with a new watch? If so, that's unfortunate. I'd like the Royal blue band, but not if the buckle doesn't match the finish of my watch.